Melissa is sharing the loveliest card over on the PTI blog, using an ink-blending-on-cardstock technique. It's so darling, and I simply couldn't pass up this sweet challenge. I've been meaning to create a few sets of cards, and this was the perfect technique to use. It's quick, simple, and really pairs well with heat embossing. Doesn't it just make the white details pop that much more? For all of the cards, I started with a colored cardstock. I gathered a variety of colors: pink, orange, yellow and red. I used PTI's Basic Bookmark 3 die, to cut out the beautiful shape. 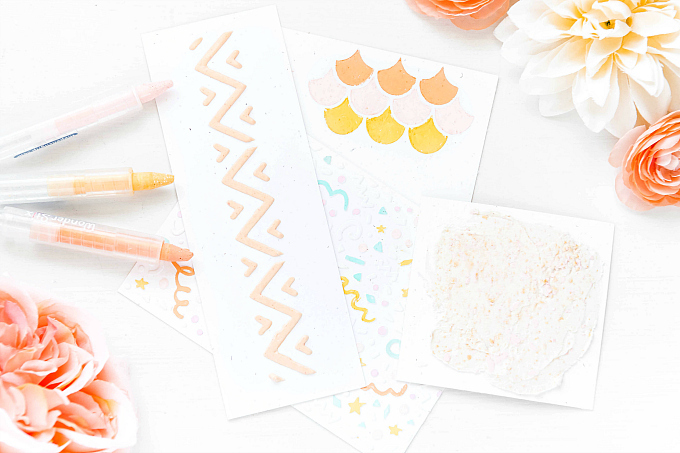 On each cardstock bit, I stamped and heat embossed a beautiful butterfly and sentiment, stamped with PTI's What the Doodle: Butterfly Mini stamp set. I used Versamark ink and Ranger's Fine Detail embossing powder. I used Melissa's ink blending technique to blend some ink around the center of each butterfly, and to add little accent flowers around the focal image. I used ink that was slightly darker than each cardstock, in colors of: Summer Sunrise, Hibiscus Burst, Terracotta Tile, and Bright Buttercup. 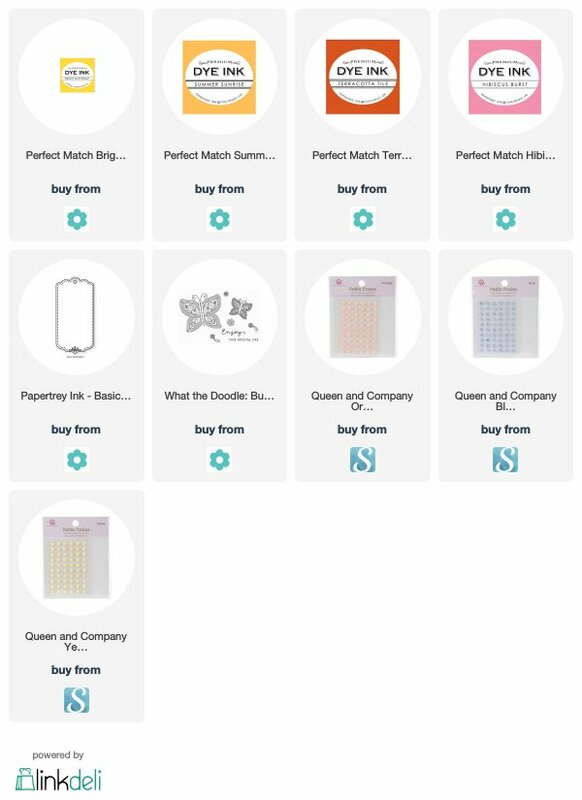 I layered each cardstock piece onto a white cardstock shape, cut with Lawn Fawn's Small Cross Stitched Rectangle dies, as well as a polka dot stamp for some detail. I layered each of the bits onto some colorful patterned paper, and added a puffy heart, some iridescent sparkly rhinestones (my favorite!) and a few liquid pearls. I havne't had time to watch Melissa's video yet, I need to get on that! Your cards are beautiful. 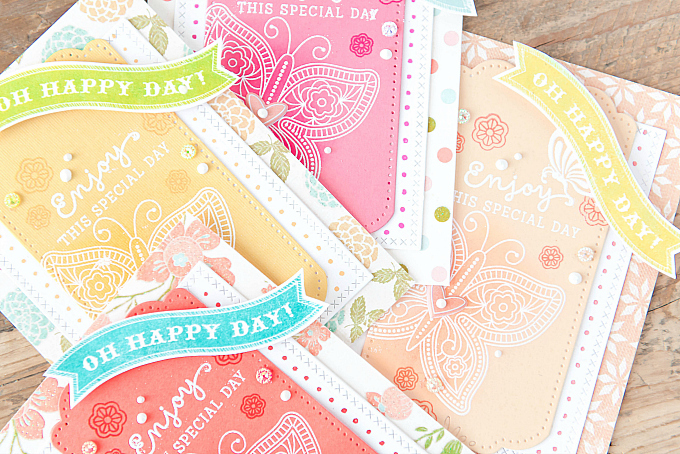 Love the butterfly, patterns papers and the variety of spring colors! Thank you so much, Lisa! Melissa's videos are always so full of ideas and inspiration and it's so wonderful that she shares her talent with us! Hope you get a chance to check it out :) Big hugs! Such sweet cards, Ivana. They make a beautiful set! Oh wow--you totally nailed the challenge! These are stunningly beautiful & I can't wait to give the technique a try! Oh Greta, you are much too kind! Thank you so much and I hope you get to give this fun technique a try soon! These are all fantastic! Such a sweet design and the colors are beautiful....very creative! My goodness these are absolutely stunning! Love that you made a set! Gorgeous! Thank you so, so much, Mary Beth! Sending big hugs! Gorgeous little flutter-bys in every single color, Ivana! Oh! all the tiny details you add... splendid! Aw, thank you so much Michele! Big hugs to you, dear friend! Love every one of these beauties, and all your sweet touches. I adore layers, and you have a gift for layering that is 'set-tacular!' Loveliness everywhere, from the bg paper, to the dies, to the happy banner! What a gorgeous set of cards!! I love your work. The colors are fantastic. Love your butterflies!! Thank you so much dear Carmela! I appreciate your kind note so much! Just popping in to say I love your takes on the PTI Make it Monday! Beautiful cards! Thank you also for visiting my blog and providing a comment! These are stunning Ivana! Wow! Thank you so much, Marlena! Many hugs! Ivana, these are four absolutely gorgeous cards! I love all the color combinations you used and the design of the card. Perfection! WOW! I love your suite of cards! Beautifully done! Biggest thanks, Betty! Love your beautiful style and your sweet note means so much :) Thank you!